This is the story of my flying/roadtrip adventure around the western USA in 2014.
a really good rig for such an adventure. Very road and air capable, at low cost. It's a real high-clearance off-road vehicle! A few notes about this adventure are in order. I've long wanted to fly the high desert areas in the western USA. As you'll see, the scenery is spectacular! High mountains, deep canyons, volcanoes, lava flows, dramatic rock formations, everywhere. And because this is dry desert country, there are no trees to hide the view. You'll see lots of rocks in this blog...... I'm also interested in water supply, and power generation, and agriculture, and commerce, and transport, all of which the Americans do in a big way. Yellow - Solar, wind, nuclear power. When I wanted to fly a particular feature, I just selected the nearest likely airfield and set up there. I mostly tried to use the unattended airfields, and there are lots of unattended, run-down airfields these days. Some were open access, just drive in. Some were surrounded by chain-link fences with locked gates, and then had to call the manager to get the pin code, or sometimes had to find the local sheriff to gain entry. These quiet airfields were also excellent places to camp. Usually with toilets, sometimes a pilot's lounge, and pretty safe, because vandals mostly stay away from airfields. I usually had the place all to myself. It was all fairly convenient, and worked really well. This sort of ultralight flying is nothing like the typical Sunday morning ultralight flight around the home ‘patch’, flying just for the thrill of flying…. I’m using the aircraft as an observation platform, for viewing and photographing what I see on the ground. I like to call this aircraft my ‘high-clearance off-road vehicle’. I’ve usually identified features that I want to investigate, whether geographical or man-made, from maps or internet, then the aircraft is such an ideal way to get a unique perspective on such features. Travelling by road only gives the flat roadside view, but from 1000 ft above, that same view becomes spectacular! This Kolb ultralight is particularly suited for such observation, because sitting right in front gives an unparalleled vista 270 degrees. It flies slowly and is very stable even when hands-off the controls, which gives time to concentrate on composing the image in the viewfinder. Every pilot at all times should be watching out for where he/she would land if the engine should quit, but very few really do that because modern aircraft engines, especially when maintained by a professional mechanic, are so reliable, and sitting in a solid, comfortable cockpit gives a feeling of security. I don’t get the same feeling of security when sitting out in front of a buzzing 2-stroke, maintained by myself….. If the noise does stop, the aircraft glides really well and lands fairly short, but my feet are the first to arrive and the rest of me is not far behind, and there’s not as much structure for pilot protection as I would like….. I’ve reinforced that protection as much as I can without a full workshop, but I still feel exposed….. 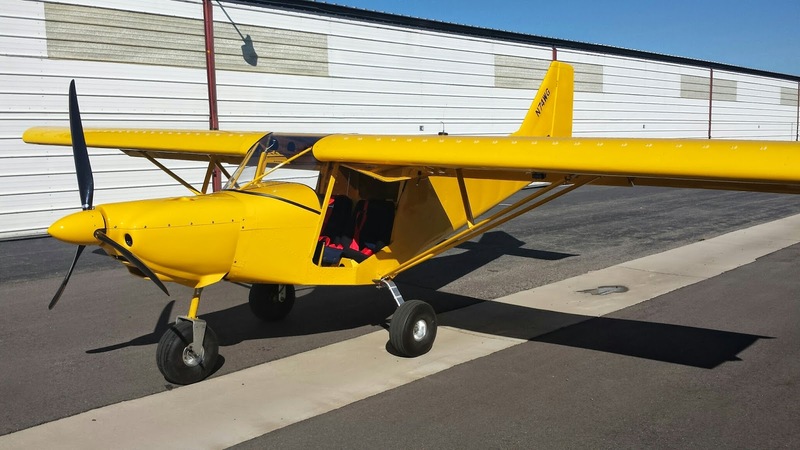 The engine is a Rotax 503, dual ignition, the best 2-stroke engine ever developed for aircraft use, but still a 2-stroke, with the inherent liability of such a lubrication system. In the past I’ve flown 1000 hrs in front of a similar engine, with never a failure, but I still can’t really relax when over hazardous terrain. And here’s the big difference from flying around the home patch where you know the terrain and already have landing sites in mind in case of an emergency. In this case it’s all new territory to me, and often harsher terrain than I would like to fly over, but it’s the only way to get to the places I want to see. So I’m forever peering down, trying to assess the landing options down there….. I always welcome some sort of road or 4WD track, and follow them whenever possible, but I know from experience that it’s always a lot rougher than it looks from up above. I always keep enough altitude to give time to set up a glide to the best option. 1000-1500 ft above the terrain gives the best panoramic perspective for photography, so I’m usually at that height, or higher if necessary. I never fly really low just for the thrill of it; that’s a different flying experience that doesn’t suit my purpose at all; it’s high risk and not good for photo ops…. A lot of the photographs I took will look like there’s no decent terrain down there at all, but usually I’m on the edge of the worst and there are better options back behind the camera. I sometimes have to turn back when I think the risk is too great, and that’s a real disappointment when it happens….. To see what I want to see, I sometimes have to be bolder than I would like, but I do want to continue to be an older pilot so must be willing to compromise….. In case I do have to land rough and am stranded, I carry a Spot satellite locator on my person, and a Personal Locator Beacon in the aircraft. Then I also have a cell phone if there’s signal, and the airband radio to contact passing aircraft. I carry two hydro packs of water and some granola bars for sustenance. I also carry a sleeping bag and a space blanket and insect repellent if stranded overnight, and lighters and matches for lighting a fire. Also a powerful flashlight and a signalling mirror, and know how to use it. To navigate and avoid controlled or restricted airspace I use a moving map GPS and the local Sectional chart. ….. I have a Second Chantz ballistic parachute that has just been repacked and a new rocket motor installed, so do have that as an ultimate backup. So I think I’ve prepared as much as possible for these adventure flights. What with constantly peering down to assess landing options, finding the features I want to see, maneuvering for the best photo composition, watching out for other aircraft, watching out for restricted airspace, calculating fuel reserves and assessing headwinds to get back to base, let alone flying the aircraft, it’s a busy time up there, in fact quite intense and seldom relaxing….. The engine and propeller are extremely noisy, to the point of stress even with an automatic noise limiting headset, add to that, freezing early morning air at altitude, and possibly bladder stress, and I sometimes wonder why I do it….. But of course, you don’t get something for nothing, and in this case the reward is well worth the effort! The Kolb is by far the best folding aircraft available. The tail folds up easily and the wings fold down and back along the boom tube, so it’s a narrow tidy package. Takes me about 20 minutes at leisurely pace to unload and unfold, ready to fly, and the same to fold/load again. Easily done on my own. It’s a wonderful asset to be able to easily trail the aircraft to different locations and then set up and fly. So many ultralight flyers are confined to their home field and close surrounds, but I’d get really bored to be confined like that. To me it’s not enough just to go up and fly around, I need to go somewhere and see something new….. I’ve travelled around a lot in bigger aircraft, camping under the wing, and it’s a great adventure to be flying out over the horizon for a long trip, but gets really old if stranded by bad weather, with the aircraft tied down outside in the weather, and with no transport to town. So with this rig it’s really good to travel around with a comfortable bed on wheels, and the aircraft packed safely away in it’s own portable ‘hangar’. If bad weather is forecast for a week, I just look at the weather map and drive to somewhere better. The trailer I have is excellent! It’s narrow enough to be able to see behind when towing, and light enough to be really easy towing, only costs an extra 3mpg. I hardly know it’s there, even towing with this 20 year-old van. The template for this blog only allows the most recent posting to be at the top of the page. I guess that makes sense for presenting an ongoing diary, but this adventure is a now a completed story, so it makes more sense if you can follow it from the beginning to the end in the time sequence that it happened. So I've faked the posting dates in order for it to appear in the correct order. That means that the dates that you see in the grey box at the top of each posting is incorrect. The real date of the flight is below the title on each post. I was born and raised near Viking, Alberta, so of course needed to go back for a visit when so close. Finally got to visit six like-minded fellas building Zenith 750s in Lethbridge, Alberta. They're building from plans, so it's a slow process, not like the kit that Tony and I built, but of course it costs a lot less this way. They've done all the structural work, and the quality of workmanship is excellent. Of course they've all built without slats and are using Stolspeed VGs instead. Guy has finished his already, and took me for a flight. Guy and I, proud of his fine aircraft. Weather forecast says a cold front is coming down from Canada (all bad weather always comes from Canada, eh...) So kept moving south, with just short flights between storms, at Augusta and Dell Montana. Fishermen camped in idyllic surroundings in Montana. There'll be trout in that little creek. Finally the weather cleared, into a perfect day at last! Time for the first real flight of this tour! Wendover airfield was a large heavy bomber training base during WW2, and was where the B-29s were prepared and trained for the atomic bomb drop on Hiroshima. Now it's just a 'leftover' airfield, but ideal for me. There's a museum and tourist attraction there now, so I had an audience of tourists as I unloaded and unfolded my ultralight and then got in and flew away.... I could hear them commenting, "You couldn't get me up in one of those...", and I just thought, "Good, you just stay on the ground and leave the fun to me..."
Flew out to the famous Bonneville Speedway on the nearby salt flats, where extreme speed attempts are run. The track stretching away to the horizon, base camp preparing vehicles to run. but didn't land because they were preparing it for speed runs. Then flew west to find one of the concrete arrows that were laid down in the 1920s to guide the first cross-country mail planes. At one time there was such an arrow, painted yellow, and with a light beacon, every 10 miles on all the major routes coast to coast. That's many hundreds of them, a big undertaking. Only a few left now, and this is the first one I found. This one is strange in that it marks a sharp right angle turn.... I have more of them marked on my map, cause I find them really interesting. The interstate I-80 to Salt Lake City crossing the salt flat. Then flew up to get a peek at the Bingham Canyon copper mine, also known as the Kennecott Copper mine. This is one of the largest and deepest man-made pits in the world. I say 'flew up' and 'a peek', because the mine itself is inside the control zone of the Salt Lake International Airport. But by flying up the west side of the mountain range I could get a peek inside, while staying just outside the control zone. Had to climb to 9,700ft to just barely get over the range. Spectacular view, well worth it! Then flew out on the salt flats beside the salt lake to find another of those concrete arrows. This one points right to Salt Lake City. A salt harvesting plant on the Great Salt Lake. This sure is Wyoming back country, with ranching and hunting outfitters being the main action. Spent all day watching weather and catching up on this blog, and mostly got it done! Next morning, much better weather, so set up and flew up into the foothills, with snow-capped peaks nearby and pristine lakes below. What grand country! Dutch John airstrip, on the other side of the gorge.